Well, this was intense. I think I have some kind of book hangover, most of you will know the feeling: you finish a great book and there’s a hole left inside of you. You want more, but there isn’t anything more to read. You’re staring at that last page, thinking: “What the hell just happened here”. That’s kind of how I feel at the moment. I’ll need some time to process this book, think about it a few days, let everything settle in my mind. The book is split into two storylines: one in the present, 4 years after Jorg took Renar Castle and one in the past, 4 years earlier, right after Jorg became King. We also get a little insight in Katherine Ap Scorron’s thoughts as Jorg reads her diary entries, scattered across the land by the wind due to an event we can only guess at, but when reading the prologue, you know something big has/is going to happen. I always seem to have a little trouble with split storylines. It’s totally my fault though, I’m an impatient kind of person. If you dangle bits of information in front of me, hinting at some kind of mystery that will be solved further on in the book, I get impatient. That’s why I wanted things to move along a little bit faster somewhere around the middle of the book. I wanted to know what happened the day Jorg went to Père Lachaise. That doesn’t mean the book wasn’t fast paced, it was! I just really wanted to know what was in the box. Bad trait of mine? I guess. The fact that I did want to know so badly kept me reading on without pause though. Back to the story. So, Jorg is King now! But he hasn’t had the chance to properly warm his throne when Prince Charming comes along. Handsome, wavy golden hair, strong, kind, a knight in shining armour. Needless to say, I didn’t like him. This Prince of Arrow seems to think he’s the one to take the Emperor’s throne (destined maybe? ), feed the poor and bring peace to the torn and scattered countries. Nope, if I want an Emperor, it’s going to be Jorg. Great right? Though Jorg would definitely make a worse Emperor than the Prince of Arrows, I still want Jorg to win. That’s how much I’ve grown to like him. To be fair though, Jorg seems a bit kinder in this second installment of the Broken Empire Trilogy. Although he doesn’t want to admit it, he’s changing, he cares. A big part of him is still consumed with hate and the echoes of the hurt that has haunted him all these years, and there are dark forces digging its claws into him, so little bad Jorgy isn’t entirely gone. There were a few moments that really touched me: the scene with Janey, the things that happened under Halradra and Justice, poor Justice, got some sad sighs out of me. I really loved the way the author kept me guessing. “Is this another mindtrick or is this real?”, “Is this Sageous again, or Chella? Or am I just being paranoid?” You knever know where the things you read are going to lead you (and Jorg), it’s an adventure for Jorg aswell as for the reader. It’s great to see how things unravel, or seem to unravel (you never know for sure with this book). Every moment can get a new, razorsharp edge when you turn the page, something you didn’t expect and leaves you doubting all the others things that happened. 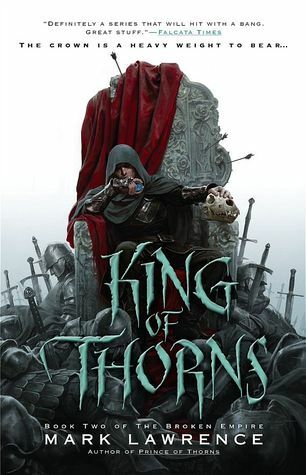 The writing was brilliant, but I didn’t expect anything less after reading Prince of Thorns. There’s always something more behind the things the author writes, something intelligent. The style he uses in his books is something I’ve never encountered before and I like it!